We provide a vast selection of clothing to suit the hospitality industry, We stock Dennys of London and Le Chef Professional as our main ranges but also stock Chef Whites and Genware Professional all provide practical, durable and comfortable combining great design with high-quality materials. 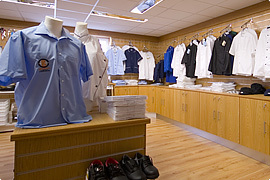 Front of house professional uniforms with corporate tailoring, shirts, blouses, waistcoats and trousers, and of course for the professional chef we can supply all your requirements from chef's jackets, chef's trousers, aprons of all styles colours and sizes, safety shoes and headwear. All can be embroidered with our professional embroidery service to promote your corporate branding, company logo or simply the staff name and role. Our next day delivery throughout Ireland means you can have your uniform quickly no matter where you live in the country. Within Connaught, we offer the option of one of our sales representatives to call in person and bring samples for sizing and feel the quality before you decide what option suits best.